Successfully Added Wotofo Sapor Rebuildable Tank Atomizer - Dual Coils, 510 Thread, Dual Airflow Control, 2ML Tank to your Shopping Cart. The Wotofo Sapor is the ultimate rebuildable tank atomizer for all vapers out there that wish to bring their overall vaping experience to the next level. With its 22mm diameter and 510 thread, this RTA fits the majority of vape box mods and electronic cigarettes out there. Crafted out of durable stainless steel, this Wotofo atomizer features a design that is not only stylish and nice to look at but also extremely tough. Featuring a sophisticated tank, adjustable airflow, and a dual-coil design – the Wotofo Sapor brings along plenty of customization possibilities for you to adjust your upcoming vape sessions to your exact personal liking. Despite its compact 22mm design, this rebuildable tank atomizer features an abundance space within its 2ml tank for you to fill up with your favorite tasting e-liquid. Its dual coils make this RTA resistant against high levels of Wattage – making it a great vape accessory for all vapers out there that wish to upgrade their current vaping experience. Simply attach this beautiful tank atomizer to your current box mod, fill it up with the e-liquid of your liking, and you’ll be all set to enjoy a powerful and tasteful vape that is guaranteed to meet your liking. Perfect for all the advanced vapers out there, the Wotofo Sapor brings along numerous of possibilities to upgrade the performance of your current e-cigarette. 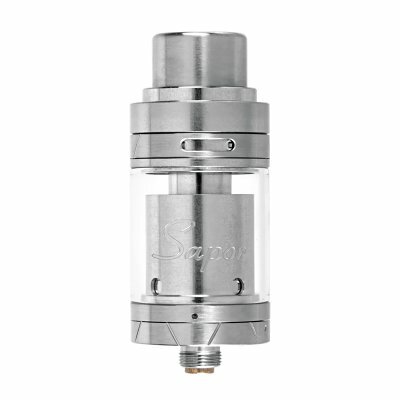 Famous for producing great taste while, at the same time, creating exceptionally large vapor clouds – the Sapor RTA truly lets you take the most out of your e-cig the next time you enjoy a tasty vape. Featuring dual airflow control, the Wotofo Sapor RTA allows you to precisely control the amount of taste and vapor created during each puff, letting you enjoy your upcoming vape in the way you personally like most. Additionally, this RTA features an anti-heating drop tip that takes away any burning feeling and taste while vaping – allowing you to fully enjoy the great flavor created by this atomizer. Along with its rebuildable design, this Wotofo RTA is easy to operate and clean. Not only does its design allow you to replace individual parts whenever needed, it also assures that your atomizer will be clean at any given moment thanks to which it fully enhances the flavor produced during your upcoming vapes. For all advanced vapers out there that are looking for an RTA that is capable of bringing their vaping experience to the next level – the Wotofo Sapor certainly is a vape accessory to consider. The Wotofo Sapor RTA comes with a 12 months warranty, brought to you by the leader in electronic devices as well as wholesale electronic gadgets..